I held a St. Patrick’s Day housewarming party this past weekend. What did I wind up serving? All frozen and ready-to-eat items… fries, salami, cheese, dips and chips, fruits, and desserts. I was simultaneously hanging pictures, unpacking boxes, and sorting out the apartment while I was getting myself ready for guests. I should have planned a menu, but I didn’t, and the lack of homemade foods was all my fault. I wanted to make lots of green and Irish-themed dishes, but those ingredients stayed in my pantry. 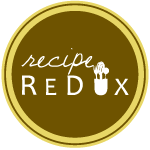 It’s time for this month’s Recipe Redux theme- Spring Clean the Kitchen! My task was to cook with at least 3 ingredients that were in my refrigerator or pantry at this moment. This post will teach you how to make a healthy dish out of whatever you have on-hand! I bought so many potatoes for this party, and, to be honest, I don’t even like them. Sweet potatoes are my jam. Regular potatoes are my nightmare. They’re just, so, blah. I never got the chance to make any Irish-themed potato dishes, so I had absolutely no use for the potatoes after the party. They would have sat in my pantry until they rotted. I searched for some inspiration on how to make these spuds taste incredible, and eureka, I found it! Just remember, folks, it’s National Nutrition Month. It’s time to “put your best fork forward,” and overly cheesy, greasy, bacon-y potato skins don’t make the cut. Better-for-you versions completely satisfy this theme. Which three ingredients will be highlighted for this recipe? Potatoes, of course, followed by avocados and salami. I never got to make the green guacamole I planned to serve, and I had leftover salami from the festivities. Get ready to be totally amazed by this healthier version of loaded potato skins, featuring those awesome three ingredients that have to get used today. Spring cleaning is way more fun when food is involved. Scrub the potatoes under running water. Dry them thoroughly. Poke holes in the potatoes with a fork, and cover them with a thin layer of olive oil. Place them in the oven for 50 to 60 minutes, until the skins are crispy and the insides are soft. Every 20 minutes, flip the potatoes over so they cook evenly on all sides. Poke some extra holes in the potatoes if the insides are not softening. Take the potatoes out of the oven. Let them cool while you start making the filling. Mince one of the garlic cloves. Add it to a small pan with some olive oil. Set the pan on medium heat, and let the garlic soften, about 2 minutes. Put the chopped salami in the pan with the garlic, and cook it until the salami slightly crisps (about 5 minutes). Rinse and drain the beans, and stir them into the pan to finish. Turn off the heat, and set the pan aside. Cut the potatoes in half. Scoop out some of the potato insides to form boats. You can scoop out as much or as little of the potato as you please, but be sure to save the extras for another dish of your choosing. Set your oven’s broiler on high. Divide the contents of the pan evenly into each potato. Place the cheese slices over each potato. Throw some pepper and parsley onto each potato as desired. Put the potatoes back in the oven for 5 to 7 minutes, until the cheese melts and starts to brown. Prepare the avocado cream- Mash the avocado in a small bowl. Add the remaining garlic clove, lime juice, parsley, dill, and pepper into the bowl. Mix well. Plate the potatoes, and put a dollop of avocado cream on each one. Serve, and enjoy. Great tasty white potatoes are Yukon Gold.